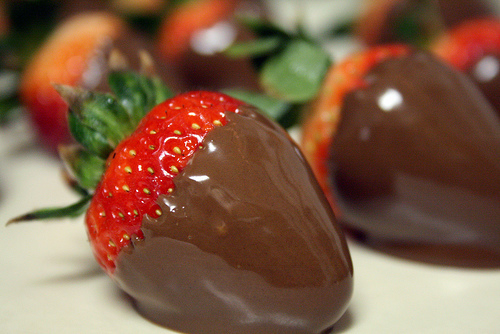 This easy recipe for chocolate dipped strawberries is delicious. It’s truly one of my favorite fresh strawberry recipes. Don’t be surprised if your kids want to help you make them–and eat them, of course. You will probably have the whole family in the kitchen with you for this easy recipe. Have fun! Wash and dry 1 pound of strawberries. Do not remove cap. Set them out to dry completely. While they dry, melt one 16-ounce bag of milk chocolate, semi-sweet chocolate, or white chocolate chips in a double boiler. Dip half- to three-fourths of strawberry in melted chocolate. Allow chocolate dipped strawberries to set on wax paper. Alternate melting method: Use the microwave. Heat chips at 80% power for 1 minute at a time, stirring after each minute until completely melted. I will be pulling out more Dessert Recipes with Strawberries this week. What’s your favorite fresh strawberry recipe?